Sanalla is inconsistent in his stance on Hafter (Photos: NOC & LNA). The chairman of Libya’s National Oil Corporation (NOC), Mustafa Sanalla, seems to be undecided about and inconsistent in his stance on LNA leader Khalifa Hafter. A look at his statements over the last few years shows an inconsistency in his view on the LNA head. At a speech to the International Institute of Strategic Studies (Chatham House) in London on Tuesday, Sanalla repeated his intention to keep the Sharara oilfield shut until the “occupiers” leave and a new force takes over. Sanalla has lost confidence in the current security force made up of the Petroleum Facilities Guard (PFG) who he has lost faith in. The decision by Sanalla to keep Sharara shut comes despite Faiez Serraj seemingly reaching a deal with the Sharara protestors on 19 December. Sanalla has refused to lift the force majeure he has imposed, claiming that oil staff are still at risk from the PFG security guards. Instead, Sanalla wants a new, united “national” Petroleum Facilities Guard, under the Tripoli Presidency Council and Government of National Accord (PC/GNA) but also directed by the NOC itself. 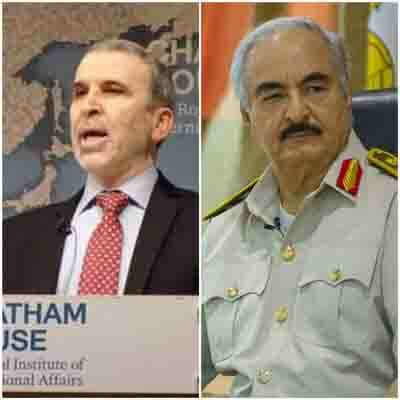 The idea is very ambitious and probably unrealistic in view of Libya’s present political polarization. The PFG is quite segmented and regional – if not tribal. The LNA, which controls PFG units in the east, is unlikely to allow control to pass to the Serraj PC/GNA in Tripoli. Indeed, the whole rationale of Hafter’s LNA push is to gain domestic and international legitimacy and recognition by proving his control, presence and effectiveness on the ground. He hopes this would contrast markedly with the ineffectiveness and lack of militia control of Serraj – especially in the south. While handing over the operation, exports and sales of oil produced from oilfields under his security control is one thing. handing over hard earnt military and political gains on the ground would seem counter-intuitive. Sanalla sent mixed messages about the LNA securing the Sharara oilfield. On the one hand, he appeared to accept the inevitability of the LNA securing it and that it would be able to operate normally. But, on the other hand, he also said: “This situation has been complicated further by the launch of an international counter-terrorism mission which has expanded into an attempt to seize control of territory, including potentially, national oil infrastructure.” Here, Sanalla was referring to the LNA’s operation in the south. “It is my concern that a sequence of events has been set in motion with unknowable consequences for Libya, and NOC.”, he added. This seems to indicate his concern and fear of Hafter gaining control of the south. This contrasts with 2016. In September 2016, when the LNA took the Ras Lanuf, Sidra and Zuweitina oil terminals from Jadran and secured the eastern oilfields, Sanalla welcomed it. The LNA, surprising many at the time, chose to hand the Eastern Crescent over to the Tripoli NOC rather than the east’s parallel NOC. Sanalla then flew east for talks with the LNA and to assess the situation. Since then Sanalla has happily lived with the state of affairs in which the LNA secures the eastern oilfields and terminals. In December, he delivered the NOC’s annual financial report in Benghazi. In view of the above reproachment, it is therefore unclear why Sanalla should now oppose the LNA taking over security at the Sharara oilfield from the very “occupiers” he so desperately wants ejected. It is not clear if Sanalla fears Hafter gaining a totally dominant position that would put him at his complete control, or if Sanalla is playing politics by signalling to the powers in Tripoli and western Libya that he is not under the total mercy or an ally of Hafter. There are real fears from his opponents that he is becoming irresistibly stronger and that his desire to drive into Tripoli, are becoming a closer reality. Today, for example, there were reports of militias in Surman and in the Nefusa mountains declaring their support for Hafter. Whilst there is no doubt that there is much latent support from the general public and various militias, it is not clear how much. Nevertheless, Sanalla could be weary of the NOC being politicized and being embroiled in this bigger Libyan east-west conflict. It will, therefore, be interesting to see if Sanalla continues with the status of force majeure at Sharara once the LNA gains control and moves in. It would put him in an awkward position.